Hi my name is Larry. I previously built a UH15T. Now I am going to build what I call a Hybrid hovercraft because it contains ideas and features of several different craft. I started out using pink foam as in the Universal 14P but I don't like the curved sides of the 14P so I am building with straight sides like David Beachy's craft. With the curved sides you have to bunch the skirt on the inside and I don't want to do that. I got skirt patterns from David. I also don't like covering it with 1/8" plywood so I am covering it with Plascore. I think Plascore will be tougher than plywood and I need something tough because I am tough on a craft. I also intend to cover the bottom with kevlar. The dimensions are 15'x7'2". The engine is a 2.2 non turbo Subaru. I am trying to get it started at the moment but don't seem to be having any luck. The engine cowling is fibre glass, with a bullet fairing extending aft to the prop hub. I slipped up though. I forgot that the prop was only positioned and not centred in the duct. 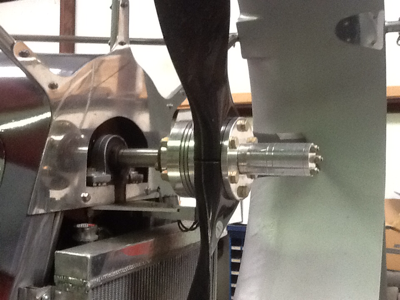 After I had finished the cowling, I centred the prop in the duct [ duuuh ]. This meant that the cowling stopped short of the actual propeller by about 4 inches. Because of its intricate shape it couldn't be extended without spoiling its contours ........ hence the large gap between the two. It is retained by two pegs at the forward end and a knurled screw knob. The aft end is secured by the same system as the battery bay cover. Here's some recent photos showing the progress on Eureka! Here's a little update to show that progress is being made. After shaping the front duct and surrounding area, we decided to cover with a layer of carbon/Kevlar cloth, which has proven to be really worthwhile as it is seriously strong/rigid now. For those interested in adjustable props I have an IVO prop on my 18 SPW. It is in-flight adjustable, with the pitch varying from 30 to 90. The cost of the prop is about $3800.00, which is a lot for a home builder. 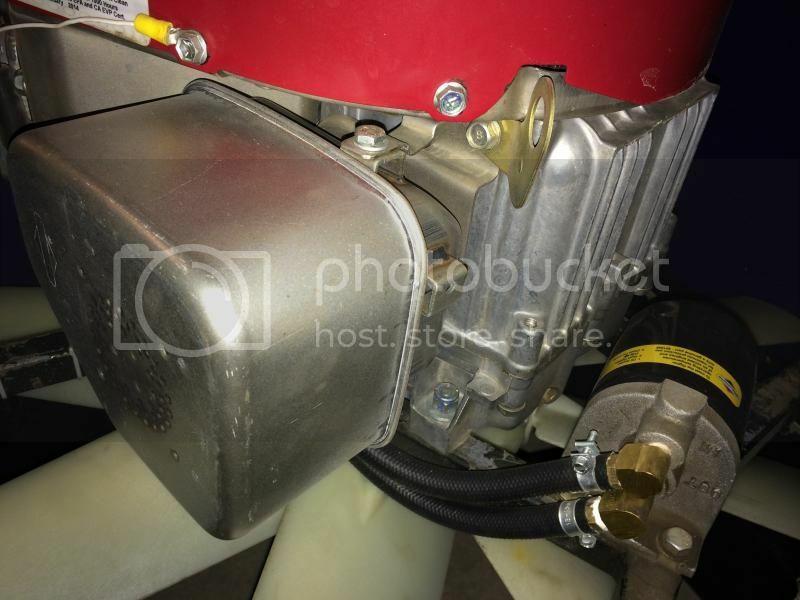 The prop is a magnum paddle prop made specifically for air boats and hovercraft. Once you figure out the "sweet spot" you will rarely ever change the pitch, so it is not really necessary to get the in-flight system. After my first time out with Sublime, I noticed that my lift fan was out of balance. The vibration popped the air cleaner cover loose on one side and broke a muffler mounting bracket. 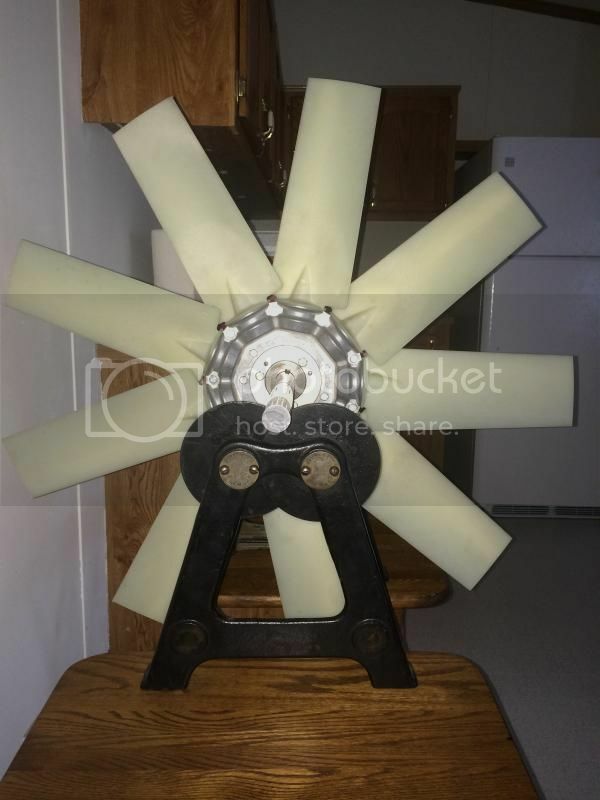 I pulled the lift engine out and rebalanced the fan. I used a hitch pin for my balancing shaft the first time but bought some 1 inch ground and polished material this time. I was able to devote some time this week to assembly. Love seeing it come together. I did have some issues with panels aligning correctly, and had to fill some gaps. All were fairly minimal and I mixed up some filler for the gaps which consisted of cabosil, glass bubbles and 1/4" chopped strand. Last night I placed the main stringers in the craft, they need to be cut to length at the back yet. Tonight I plan on getting some of the panels at the back installed. Overall I'm very pleased with how things are coming together. After weeks of putzing around on the craft, I was finally able to take it to Muscoda and try it out. Being a different animal than the StarCruisers I used to pilot, I had a fun time with the controls. I never ran a stick control before, and the lift throttle is the opposite direction. After running over a tree stump and almost taking out the mailbox, I was out of the yard and across the street. I made it to the launch and waited for some canoeists to launch. I cranked up the lift, hit the throttle for thrust and I was out on the Wisconsin River after 2 years of being a bystander. I felt more comfortable when out in the wide open space. Plenty of room for mistakes without repairs. I went 6 miles upriver, turned around and came back. It seemed ok but still needs some adjusting. The drive belt was too loose and could only achieve 42 miles per hour. Also, my lift engine was shaking too much so back to rebalancing the fan next week. I used a crappy hitch pin as an arbor to balance it on. A 1 inch ground shaft is on order. Well so far it's been a stretch to get much done. However, I have got some things done. I have got a good start on the floor panel, and have started to draw out some other panels on the foam. So far I'm very happy with how easy the glassing has gone. The polyester resin wets out nicely and has had good working times. I have not used glass mat before either and it has been quite easy to work with. I can't wait to start to devote some serious time to this endeavor. Lady luck smiled down on me yesterday as I was at the local hardware store. I haven't updated anything since the first post but I've certainly been putting at least some of my time towards getting this thing moving. I have one of those jobs that eat up almost all of my time during the summer and the kids with sports take up the rest. But in those tiny spaces left in between I've managed to get some things done. I ordered both the foam and the resin, and I have got the garage organized in preparation for this build. Today I built a work platform to glass the various panels and to use as a jig for when I start assembly. It's a relatively simple affair, just a osb over 2x4 structure that sits on sawhorses. I feel the itch to hover getting stronger, but not ready yet. I have the lift engine on the mount ready to go in, but I had decided to change the exhaust from the way it was. I ordered a Low-Tone Briggs muffler and manifold to bolt on. Once I tried it on the engine, the mount was in the way. I tried to come up with custom piping to move the muffler to the front of the engine, but I gave up on that too. I ended up ordering another manifold and muffler. Only problem is that the muffler goes where the oil filter is. I had to order a filter relocation kit from Briggs. I am sure that Briggs loves me. My order should be here early next week. 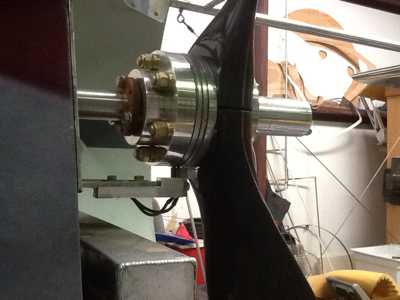 I then felt the need to double check the alignment of the stub shaft coming off the Everflex coupling on the engine. Problem was that the bell housing was in the way. I thought it over and decided that I do not need a bell housing so I cut it in half to get it out. This was easier than pulling the engine to remove it. I set my magnetic base indicator on the stub shaft but it would not stick. Wow, shaft is stainless. Time for plan B. Lucky that I had an indicator mount that straps onto the shaft. I started checking and found the alignment needed a little adjusting and am working on that now. One problem that I have is that the rear bearing is high and it had no shims under it to remove. I can lower the front of the engine, raise the back of the engine, or mill the base of the rear pillow block. Lowering the front of the engine would be the best thing to do but that requires lifting the engine to move the holes down. I also thought about making some bolts with a smaller diameter shank. I think I will try this method first. After that, I can customize the remains of the bell housing so I can mount the starter. I think it will be another two weeks before I am able to take the hover out and try it.